From your perspective as an individual humanitarian or volunteer. A digital badge is an digital version of a certificate that can be shared online. It contains information about skills and knowledge you have achieved that you can share and have verified. For example, if you have taken a course in project management, you may earn a digital badge as well as a certificate, enabling you to publicise your achievements to potential employers through an online profile and via social media. Our digital badges support the Mozilla Open Badge standard, wihich means they can be read on many different platforms. 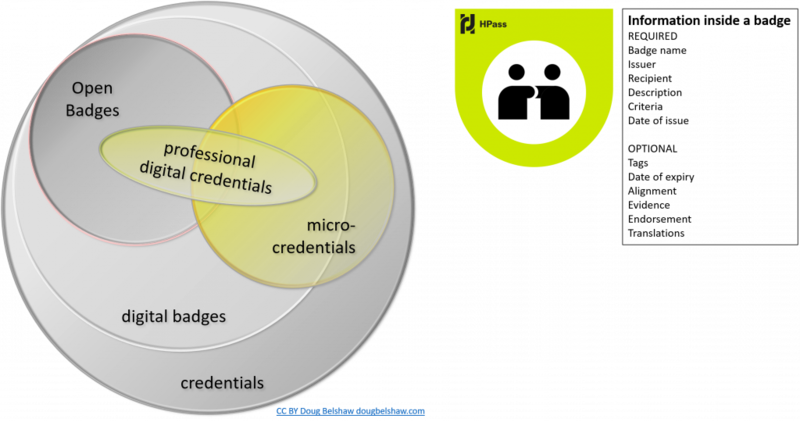 The HPass vision for digital badges is to foster the recognition of learning, skills and experience of humanitarians everywhere, no matter how they were obtained. We want organisations to validate and encourage individual humanitarians like you along career pathways that will make you more effective and better able to help people in need. Can I join myHPass as an individual humanitarian or volunteer? Yes, myHPass is a free service for individual humanitarians. How do I join myHPass? If you already have badges, you can create a free account for yourself at my.hpass.org and upload your badges. Otherwise, when you earn your first digital badge from an HPass badge issuer, online messages will guide you on how to accept the badge in myHPass. What can you do with a digital badge? As a humanitarian or volunteer, you can store and share your badges in a free account in myHPass. From there, you can share your badges directly, on social media such as LinkedIn, or on other platforms such as personal ePortfolios. How can I earn a digital badge? Normally, you will earn badges from organisations, such as a learning and assessment providers or your employer. This may be for a course you have taken or a competency assessment you have completed. You can earn your first badge by claiming the HPass Supporter badge. We also encourage you to try taking courses on Kaya, a free humanitarian learning platform hosted by the Humanitarian Leadership Academy. A growing number of Kaya's courses now offer badges for successful completion. How do I accept a badge? If you are are awarded a badge by a badge issuer, you will receive notification by email. The email will have instructions about how to accept the badge and store it in a free account on myHPass. How do I share a badge? Your myHPass account has controls for you to make your badge public and share it on myHPass and in social media. You can also create Pages on myHPass to display your badges with other material, such as your résumé. You can also edit a professional page on myHPass called My Profile and share that with others. Can I upload badges from other systems on myHPass? How does HPass compare to social media such as LinkedIn? Our mission is to enable individual humanitarians and humanitarian organisations to develop and share skills to strengthen humanitarian action. We are focused on providing a better connection between humanitarian employers, learning/assessment providers and individuals. This is why HPass is designed to provide evidence of your achievements, instead of just being a place to host your CV.